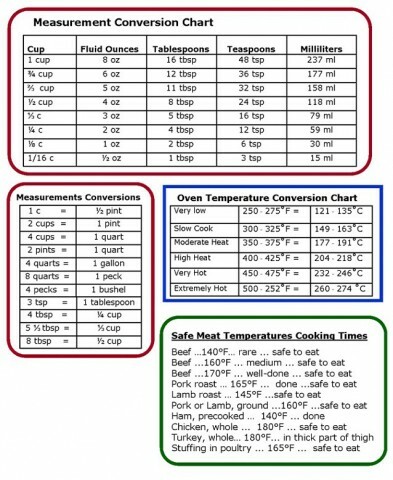 Here are a few tips, measures, conversions and equivalents that are helpful in kitchen. It's Important to note that all measures discussed here are based on a "scoop and level" method where you simply scoop out the ingredient using a measuring cup or spoon and scrape off the excess using a flat edge like the back of a knife. 3 pounds of whole apples yield about 8 cups of sliced apples, and 3 1/2 cups of applesauce. 2 ounces of lightly packed fresh bread crumbs yield about 1 cup and 2 ounces of dry bread crumbs yield about 3/4 cup. 1 pound of butter equals 16 ounces, 2 cups or 32 Tb. A 1/4 pound stick of butter is 4 ounces, 1/2 cup or 8 Tb. 2 ounces of lightly packed, grated cheese is about 1/2 cup. 1 large egg white weighs about 1 ounce or 2 Tb. 1 large egg yolk weighs about 1/2 ounce or 1 Tb. 1 medium clove of garlic is about 1/16 of an ounce or about 1/8 tsp. Tip: To remove the smell of garlic from your hands, rinse your hand in cold water, rub with salt, and rinse in cold water again. Then wash hands with soap and warm water. Repeat if necessary. This will also work for onions! 1 medium onion is about 2 1/2 to 3 ounces. 1 pound of sliced or diced onions is about 3 1/2 to 4 cups. 1 medium potato is about 3 1/2 to 4 ounces. 1 pound of sliced or diced potatoes is about 3 1/2 to 4 cups. 1 pound of unpeeled, raw potatoes will yield about 2 cups of mashed potatoes. 1 cup of raw rice equals about 3 cups of cooked rice. Use 1 to 1 1/2 tsp. of slat per quart of liquid when boiling vegetables, flavoring soups and sauces and per pound of raw, boneless meat. Tip: If you over salt a sauce or soup, you can remove some of the saltiness by grating in raw potatoes, simmer them for about 6 to 8 minutes and then straining the liquid. Potatoes can absorb much of the excess salt. Also, After cutting hot chili peppers, be sure to scrub your hands and nails with soapy water, then soak them in saltwater and rinse. This will prevent the stinging chili oil from getting in your eyes. 1 cup is about 6 1/2 ounces. 1 pound is about 2 1/2 cups. Tip: To prevent cookies from becoming stale, store in an air-tight container with a handful of sugar cubes. This trick also works for breads, cakes, and even cheese. It will prevent mold growth and keep them tasting fresh. 1 cup is about 2 3/4 ounces.